Seven years ago, some girls on my football team suggested I join them at an event called the Danskin Women's Sprint Triathlon. I had recently completed an 8K (the furthest I'd ever run!) and I was ready for a new challenge. I already had a swimsuit, I just needed a bike. The budget was tight, so I went for the cheapest secondhand bike with air in the tires - a GT Hybrid - and started biking the 7 miles to work on it. A co-worker, horrified by my new ride, admonished me, "You can't do a triathlon on THAT thing!" A bike is a bike. If it can go 7 miles, it can go 12. Of course, I proved her wrong and I did do my triathlon on "THAT thing," finishing a respectable 368th place, thank you very much. Every year I've returned (excepting the broken leg year) with a few more details refined, inching my way up in the ranks. In 2005 (with a new, lighter secondhand bike) I came in 30th place. wow! In 2007 (with an actual new bike) I cracked the top ten overall, coming in 8th! In 2008 I made the leaderboard, in 5th place. In 2009, I came in 3rd, one second behind speedy Stacy Kiefer, and then in 2010, we swapped spots - she came in 3rd to my 2nd. This year, Stacy held the lead for awhile, making me chase her all the way to mile 8 of the bike course. Once I moved into 1st, the motorcycle escorts guided me in, red & blue lights flashing to announce the arrival of my mini-motorcade. 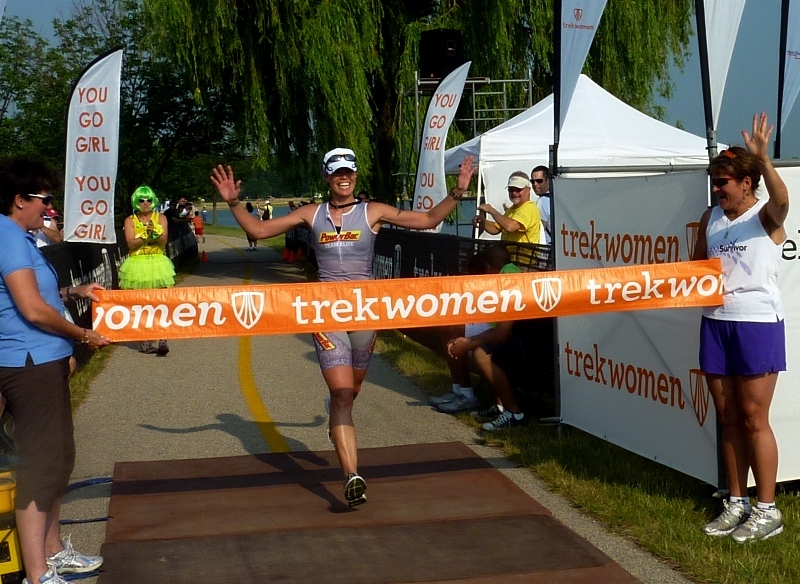 The run course out there may not have a single spot of shade, but it's filled with memories, from all the past years of the Danskin Women's races, then the Trek Women's races, and the Pleasant Prairie Triathlons too. This is the 10th time I've trotted alongside Lake Andrea, wishing I could just dive right back into that refreshing water and take a break from all this silly running business. I remember the exact spot where, in 2004, I dumped a cup of water over my cotton T shirt and quickly learned that - while it's a clever way to cool off in dry climates like California - soaking your cotton clothing in midwestern humidity is rather like wrapping yourself in a sleeping bag on a hot day. And I distinctly remember that glorious moment of victory 7 years ago when I saw the finish line come into view, and knew it was all mine. well, 1st place or 368th place, it's still a grand moment. I guess some things you never grow out of.